As an alternative to showing yet more chain stitch (done now! Stem stitch time!) 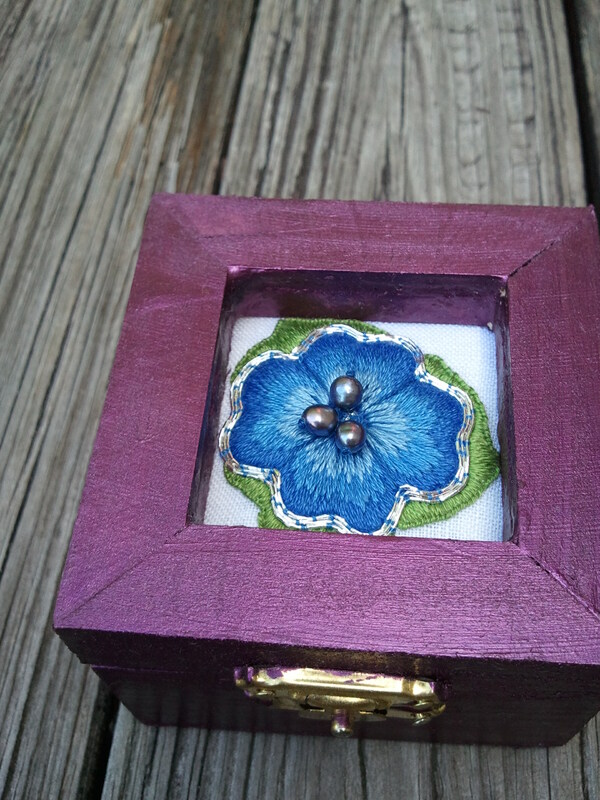 I photographed another little box I made a few months back. 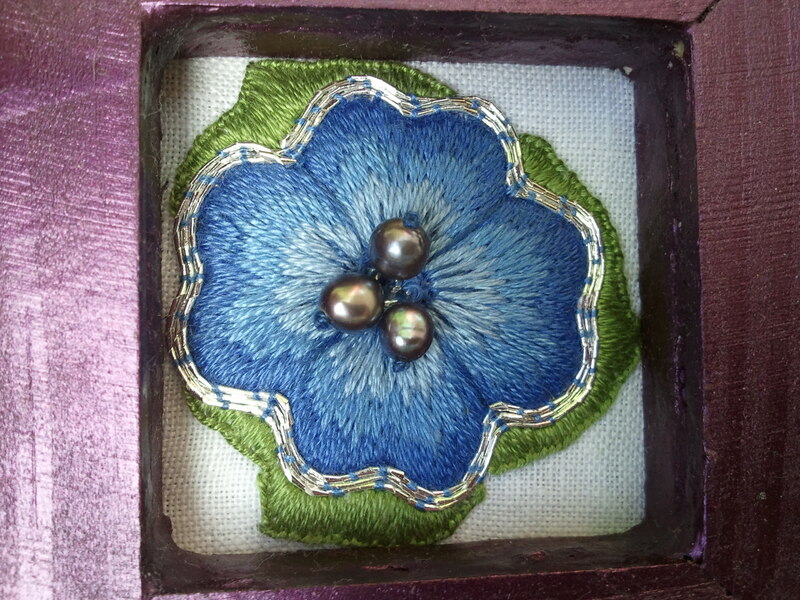 This one was a small foray into working with metallic threads. Most of what I know of goldwork, I’ve picked up from Mary Corbet’s blog, and from staring longingly at Tanja Berlin’s designs. A small design is a good way to test the waters and see if the technique is for me. Of course, a better way would be to get a kit that tells you how to do it in detail, but I had some Japan thread on hand. There are a few techniques that I love the look of but am not crazy about doing, blackwork being one example. Looks great, feels tedious after a bit. Wish I liked doing it more, because the end result is lovely. This, on the other hand, was fun enough at the small scale that I felt confident enough to add a ring of silver around the stumpwork bug piece. There’s actually a very small circle of Japan thread under the beads as well. 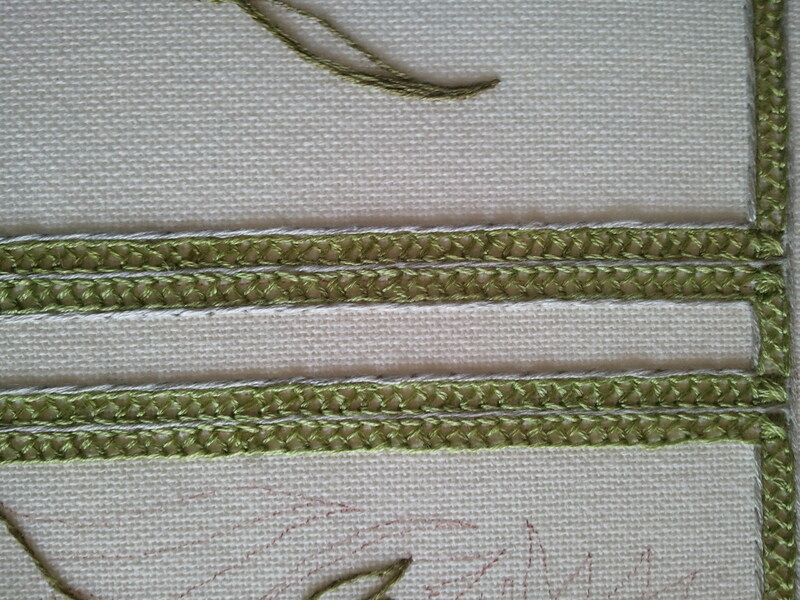 Did I say I wasn’t going to post yet more photos of chain stitch? That was a lie. This is one of those moments of progress that doesn’t look like much, especially to the non-embroiderer, but there you are.”I’ve added one twenty-secondth of an inch! On all sides!” you might exclaim. “Hmmmm,” they reply, and back away by much more. The chain stitch is finished. The stem stitch is nearly finished. Not too much more border to go. 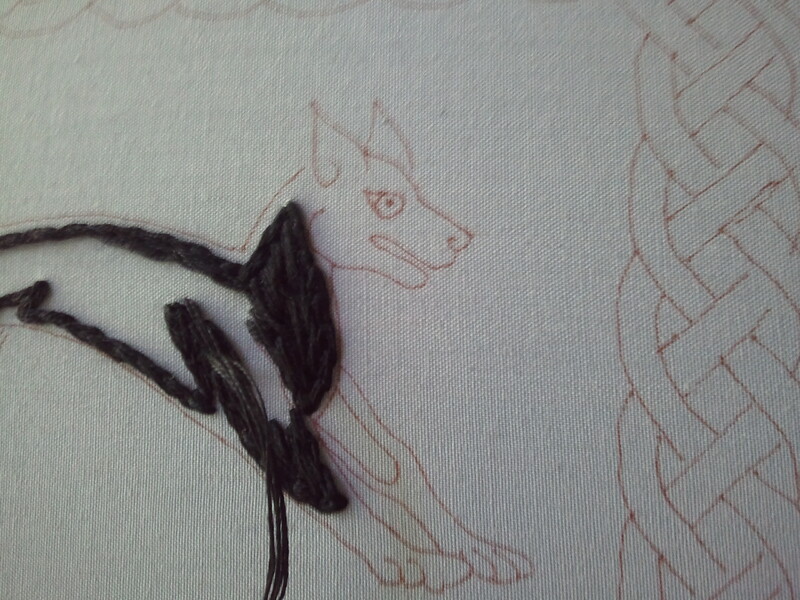 And I’ve started the dog as well. I’m filling in his body with split stitch, so that when I cover it with satin stitch, it will be padded and stand out nicely. I’m using six strands of floss, and it feels enormous. I’m looking forward to the satin stitch phase, where the split stitch will get covered with Caron Waterlilies in Dark Shadows. I’m going to use more split stitch for the areas around the satin stitch, but in much less puffy quantity– one strand. This entry was posted in Uncategorized and tagged black dog, box tops, carnation needlebook, embroidery, needlebook, obscure nerd references, surface embroidery by Rene. Bookmark the permalink. Thank you! Long and short stitch is one of many techniques I’m trying to improve at.